If you’re considering more of an administration-type career within the health field, there are two important paths to think about: medical billing and medical coding. They are completely separate, yet ‘best friends forever’ careers that are often lumped together. Read on to find out more about the differences (and similarities) between medical billing and medical coding jobs. 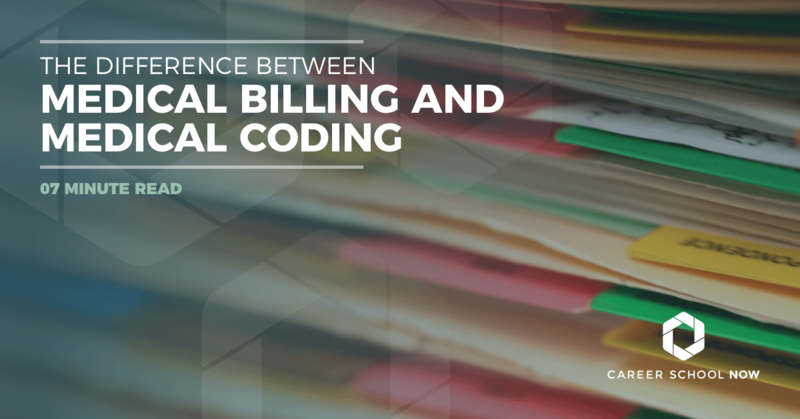 Contrary to popular belief, medical billing and medical coding are different careers. Two separate, yet perfectly fitting pieces of a puzzle. While they both live in, say, the same apartment, they occupy two different rooms. However, they work together for a common goal, third-party reimbursement, whether it’s the insurance agency or the patient. Some shared responsibilities of the two positions are: being in contact with the insurance companies in varying capacities as well as with the patient. More typical duties that both medical billers and medical coders are held accountable for is accurately coding claims so that the doctor gets accurate payment while keeping the patient content that they are being charged fairly for the proper diagnosis. Find a local medical coding program. A medical biller has three parts to their job: creating claims, transaction reports, and patient billing. A biller worth their salt will be skillful at helping all parties involved navigate the murky waters of laws, regulations, and guidelines. Enroll in a medical billing program today! There are very in-depth codes that both medical billers and medical coders must know. The CPT and ICD-9 or 10 are the two main components to any medical claim. When the codes are combined, it tells the story of why the patient came in and what procedures were done. CPT Code: The Current Procedural Terminology code is used to bill outpatient and office procedures. These codes are used along with the ICD-9 and ICD-10 to bill the payer. There are thousands upon thousands of codes within this system. CPT codes are what doctors can charge for, and in turn, get reimbursed by insurance companies. ICD9/ICD-10: ICD codes are used to track the incidence and spread of disease and illness across the country. It also will explain to the insurance payer what and why a certain procedure was performed. Codes are three to five digits, either numerical or alphanumerical. In the event of a more detailed disease, subcategories would be used to go into more description. For example, "disease" would be a major category, but following that, more coding would explain where the disease is and how it’s being treated. Of course, it goes deeper than our example as there are over 70,000 codes in this one system for a medical coder and medical biller to be familiar with. HCPCS Codes: HCPCS, aka Hicks Picks, are both short for Healthcare Common Procedure Coding System which was developed for Medicare and Medicaid to maintain a way to report medical procedures and services. Certification is not required. However, getting certified is highly regarded and recommended because most healthcare facilities prefer coders and billers to be certified. The prerequisite to getting the right education is a high school diploma or GED. Classroom and online learning are available to earn medical coding or medical billing certification. Most programs for both coding and billing require courses such as medical terminology, medicine codes, procedure, and supply. Also, an introduction into the medical industry bills and laws such as the HIPAA, Affordable Care Act, Fair Debt Collection Act, and the False Claims Act. When choosing a medical billing or coding program, one of the most important factors is that it’s an accredited school. Several certifying organizations such as the American Medical Billing Association (AMBA), the American Academy of Professional Coders (AAPC), and the Medical Association of Billers (MAB) offer prep programs for certification exams. Organizational skills: The billing and coding systems are incredibly complex. Plus, depending on the size of the office you’re employed with, you could be dealing with hundreds, if not thousands, of medical records. If you don’t have some semblance of organization, then most likely you’ll drown in a tidal wave of messed up files. Analytical prowess: Both positions have you dealing with records, numbers, and money, so it’s an automatic must that you have analytical skills. Things need to be in the right place, with the correct codes, so being analytical mind will help you hold yourself accountable for proper form. It’s all in the details: Being detail-oriented is, by far, the single most important quality of a good coder and biller. There are so many layers to a claim, and if it’s rejected, it’s up to the coder to figure out what happened and to make it right. For a medical biller, all the claims have been coded and billed, and it’s just your duty to retrieve proper payment in whatever capacity is necessary (as long as it’s legal). You’re fluent in chicken scratchings: Otherwise known as, doctor’s handwriting. Doctors aren’t known to have the best penmanship, but it’s up to the medical biller and medical coder to know exactly what was written. Go team: You’re part of a large team made up of medical professionals and patients. You need to have the emotional and mental capacity that allows you to deal with people other than your little lonesome. Even if you’re the only coder or biller, you will still have co-workers you need to get along with. Compound that with patients who want to make sure they aren’t being taken advantage of by the insurance system. We get it; it’s a tough decision figuring out which route to take when it comes to selecting a career in medical billing and medical coding. Benefits are abundant in both areas. For many, one of the greatest determining factors is collaborative environment versus independent work. If you thrive and grow working alongside a team, then medical coding is the route for you. If you prefer working independently, having full autonomy, then choose medical billing. Both careers provide a decent wage and fantastic work satisfaction. Whichever route you choose, just be sure to gain the proper education and certifications so you can grow in the field. The Bureau of Labor Statistics website reports that the median annual wage for medical records and health information careers was $38,040. The top 10% in the field earned $62,840 per year, while those just starting out made over $25,000. Most people in these careers work full time, and some work weekends and evenings. Between now and 2026, employment for health information technicians such as medical billers and medical coders is expected to grow 13%. This is much higher than the average 4%-7% most other jobs will see. The high growth is due to the fact that, as the population of the U.S ages, more technicians will be needed to maintain their health records. Also, an increase in electronic medical records will create a need for qualified individuals to maintain them.